50 year old man known at our institution since 2012. He initially presented with an out of hospital cardiac arrest based on ventricular fibrillation. Coronary angiography was completely normal and ultrasound showed a normal LV function with hypokinesia in the inferior wall. 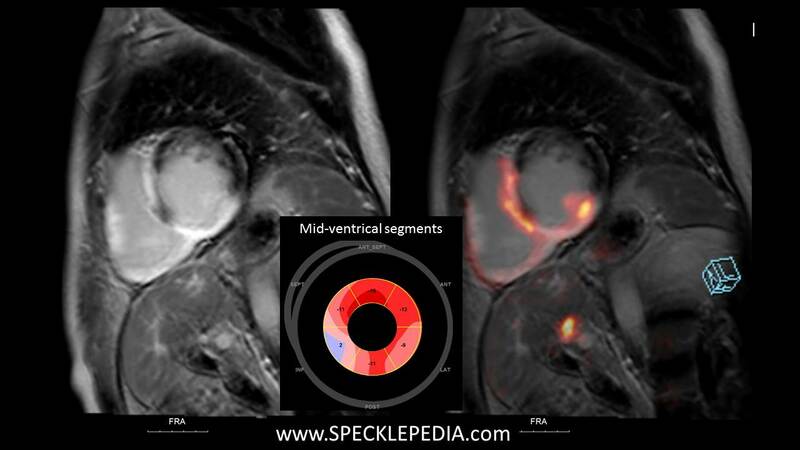 CMR at the time of presentation showed a focal epicardial spot of delayed enhancement in the inferior wall with a normal LV and RV function. Genetic testing was negative. Patient was initially diagnosed with VF after a possible myocarditis and received an ICD for secondary prevention. His LVEF showed a progressive deterioration on ultrasound (see below) in a period of multiple appropriate ICD shocks. The echocardiographic findings, the CMR findings and the PET imaging are show below. The whole-body PET-CT scan showed activity in both lungs, mediastinal lymph nodes and in the myocardium. This fitted with sarcoidosis (also confirmed by tissue diagnosis) and patient was treated with prednison. 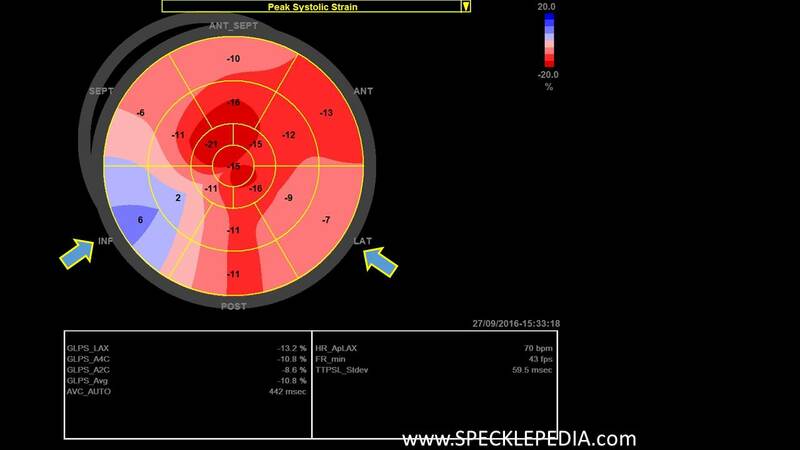 The LV is dilated with a end diastolic diameter of 63mm. LV systolic function is poor. Calculated LVEF of 25-30%. The inferior wall shows clear wall motion abnormalities, all other segments appear hypokinetic. 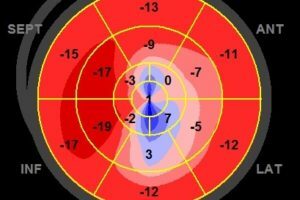 In the apical region there is pronounced hypertrabeculation, although the cut off values for non-compaction cardiomyopathy are not met. There are no relevant valvular abnormalities. RV function is normal and the estimated RV systolic pressure is 32mmHg. 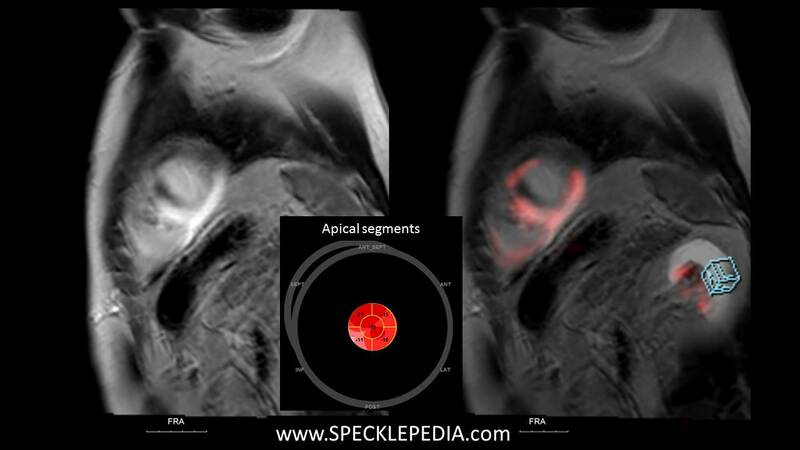 Deformation imaging shows an atypical distribution of abnormalities. 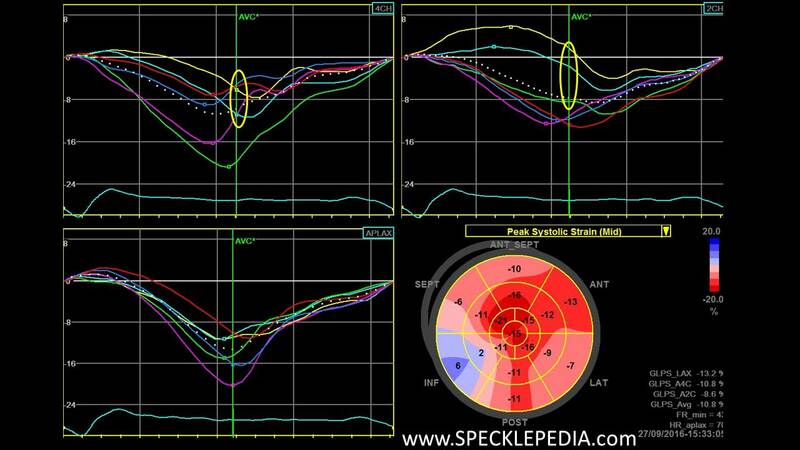 The inferior wall shows dyskinesia (positive strain values in systole), corresponding to the abnormal wall motion analysis. In the basal region, these abnormalities are not restricted to the inferior wall and extend to the basal inferoseptum and anteroseptum. 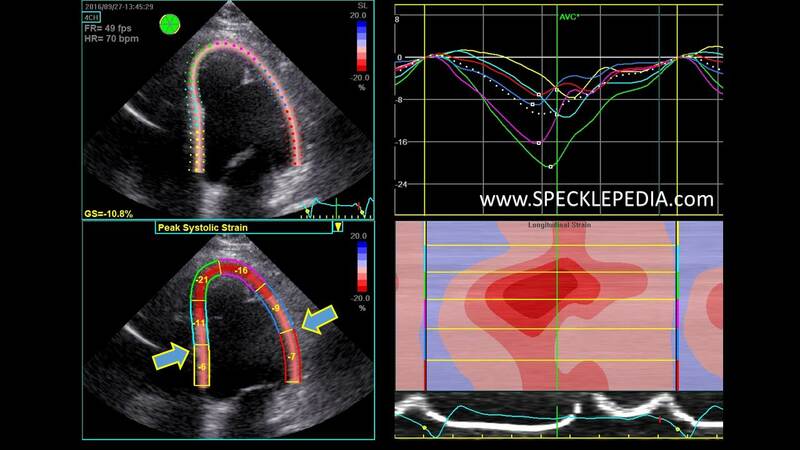 In the lateral wall, peak systolic values are also severely depressed with values not reaching the -10%. There appears to be some preservation of function in the posterior wall, the anterior wall and the distal anteroseptal wall. This distribution pattern of abnormalities does not fit with any known cardiomyopathies (see cardiomyopathy section). This is suggestive of a form of myocarditis with multiple affected regions. The clear abnormalities in distinct regions with (relatively) preserved function in between is suggestive of sarcoidosis. MRI showed transmural delayed enhancement in the inferior wall from base to apex. 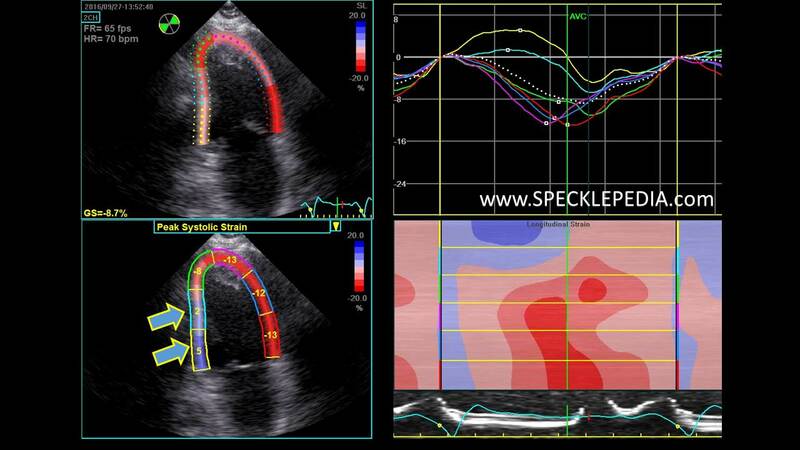 There is non-transmural delayed enhancement in the inferoseptal and anteroseptal wall. 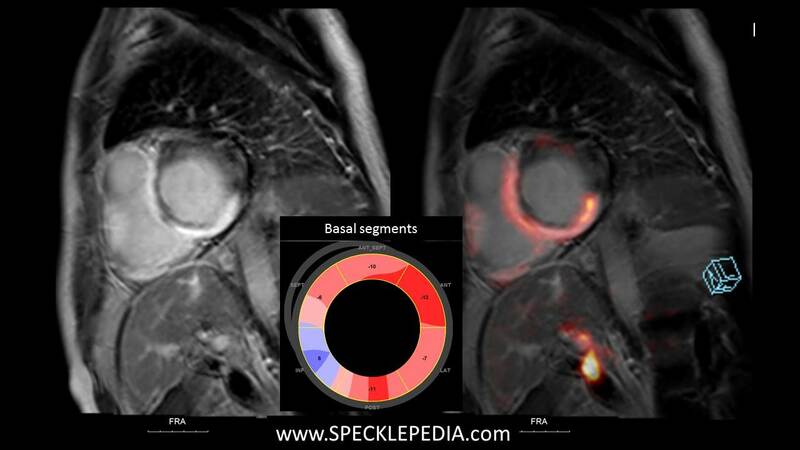 The PET scan shows us activity in septal wall, no activity in the inferior wall, and again activity in the lateral wall.